Education Cuts Leaving Your Kids With Half A Brain? HomeEducationEducation Cuts Leaving Your Kids With Half A Brain? When it comes to cuts, the first thing that educational institutions usually look at dropping is the arts. This is nothing new; seen as the less useful part of learning and development, arts and crafts subjects are routinely cut to save money and time for more academic pursuits. But should parents be worried? The short answer is that everybody should be worried. While academic subjects such as maths, science and languages certainly shouldn’t be neglected, creative pursuits of all kinds are essential to child development. They not only help to develop a more rounded individual but also help to foster a surprising number of skills that are not obvious at first. The good news is that art, crafts and other similar hobbies don’t need to be left to your kid’s school hours. With Papercraft supplies easily available, you should consider ensuring that your kids can benefit from the developmental opportunities this skills bring. The two sides of the human brain perform different functions; the left is responsible for thinking analytically and rationally. The right side controls intuition, creativity and our emotional perceptions. Traditional subjects taught in schools tend to focus heavily on skills that the left brain excels in – maths, sciences and reading skills all focus on the area that this side of our brain controls. There is nothing wrong with this, of course, but the two sides of our brains haven’t evolved to leave one ignored and unused! Arts, crafts and all creative pursuits exercise the sometimes neglected right side of the brain. Brain activity measured in those involved in creative work demonstrates that both sides of the brain show increased electrical activity when engaged in crafts or art (logic, maths and reasoning all play their own parts in creative tasks). Exercising both sides of the brain not only creates new structures in both but also builds more links between the two. Those who practice arts and crafts therefore stand a good chance of being able to bring the full power of their brains to just about every situation they face in life. They say two brains are better than one, but using one to its maximum potential isn’t a bad idea! Traditional education (maths for example) often focusses on ‘right’ and ‘wrong’ answers – as it should. However, life is full of grey areas where no simple, or single, solution exists. Creative thinkers tend to be more adept at dealing with the many shades of grey that life presents them with. This is a skill that is essential in both life in general but is increasingly important in our working lives. Problem solving, original thinking and the ability to adapt and change our ideas are all fostered by creative hobbies and pastimes. Failure is a part of life too and those who enjoy creative hobbies at a young age learn to understand this early! They are also generally better at learning from their failures and adapting their mind to find solutions that work. Self-expression is another important area in which arts and craft hobbies can benefit your kids (and yourself). Verbal and non-verbal communication techniques are quickly learned when you undertake craft or art projects. 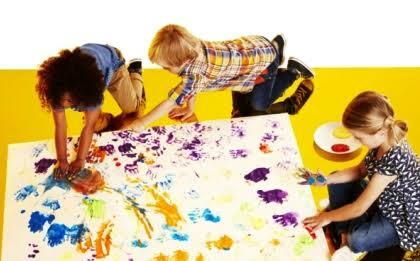 Teaching your kids to express themselves through painting, writing, playing musical instruments, dance or even sculpture allows them to not only examine and interpret their feelings and emotions but to learn from an early age to convey those emotions. In terms of mental health the ability to express our deepest darkest – or happiest – emotions is a big plus. Have a ready supply of arts and crafts supplies to hand. From pens, crayons and paper to glitter and glue, make sure there is a ready supply to hand. Display the creations of your kids in pride of place. OK, so you may not (yet) have a mini-Monet or a pint-sized Picasso on your hands but always ensure that you display kids masterpieces. This encourages a sense of value in their creative endeavours and in themselves. Don’t forget to get down and glittery with kids as they work. Create with your kids and hold competitions between them, yourself or friends. The benefits of creativity are not just good for kids and you’ll soon find that the sense of satisfaction, calm and plain fun may well be just as good for you! Exposure to the world of arts, crafts and all things creative is always good for kids. Visit museums, galleries and art shows on a regular basis. This helps to encourage kids to focus on their creative side and also helps them to see what is possible. Get kids involved in reading, dance, music or any other creative form that appeals to them most. Clubs and groups are also often available and this can introduce your kids to a wider social group outside of school, helping to teach valuable social skills at the same time. Arts and craft hobbies not only help to develop your child’s skills in a hugely beneficial number of areas but they, unlike some subjects, are intrinsically fun! Ultimately, engaging your kids in creative hobbies can help to demonstrate to them that learning is not all hard graft! This can also increase their performance in other areas of their education, as they learn to be more creative and more curious about the world around them.